Fake news. Alternative facts. So-called judges. The election of Donald J. Trump to the presidency may have surprised the nation, but no one was surprised that his first hundred days in office defied conventional politics at every turn. At the heart of this unpredictability were the president’s own words. Unafraid to state his opinion—whether in interviews or on Twitter—Trump’s unfiltered comments dominated the nation’s news cycle, beginning with his inaugural address. The news media dutifully broadcast these quotes at a breakneck pace. Some circulated in the news for only a few hours until the next story hit. Others redefined the national narrative for weeks, and even led to federal investigations. In this book, veteran author Jason Boyett tells the story of the first few months of Trump’s administration using these public statements. 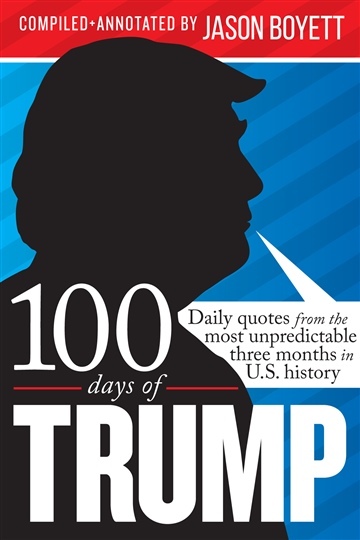 In a quote-a-day format, he relies on the president’s own words—along with statements from those connected to his administration—to examine the personality, purpose, and values of the Trump administration as revealed during its first hundred days. 100 Days of Trump is a unique guide to an unforgettable moment in American history. Not only does it chronicle the roller coaster of President Trump’s first few months in office, but it analyzes the significant roles played by language and communication in defining the American presidency. Jason Boyett is the author of more than a dozen books on religion, history, and popular culture, including Pocket Guide to the Apocalypse (2005) and O Me of Little Faith (2009). His most recent books are Lust Chaos War Fate, a survey of Greek mythology, and 2016's 12 World Religions: The Beliefs, Rituals, and Traditions of Humanity's Most Influential Faiths. His work has appeared in publications as varied as The Guardian, The Daily Beast, American Cowboy, and Amarillo Magazine. Jason and his wife, Aimee, are the parents of two teenagers and live in Texas.